The Duero is a river inextricably linked to wine. Rising in highlands near another famous Spanish wine region, La Rioja, it trickles its way through the arid, dusty plains of Old Castile en route to Portugal, where it becomes the mighty Douro, whose terraced slopes are cultivated with grapes that give rise to the country’s many varieties of Port Wine. 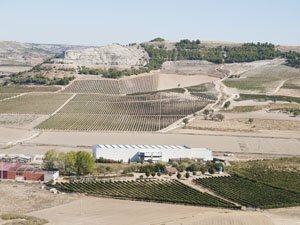 Compared to this landscape not unlike the German Rhineland, the Spanish wine growing region of Ribera del Duero is somewhat of a poor relative, parched and plain in comparison, yet it is here that some of the finest wines in Spain are produced. The Ribera del Duero is not actually a geographical or political region, but a wine demarcation area that follows the adolescent course of the Duero from El Burgo de Osma westwards towards Valladolid. It is in the shallow valleys of the Duero and its tributaries, around Valladolid, from Zamora upstream to Aranda de Duero, that an ancient winemaking tradition flourishes to this day. The cultivation of vines in a region with such a harsh climate suggests a population as thirsty as they are hardy, but in time a winemaking region of note evolved here, originally producing the heavy, alcoholic wines that were in favour during the Middle Ages. To our taste, the reds would have been almost black, the whites like a primitive sherry, but gradually centralised rules and regulations started to improve the overall quality. 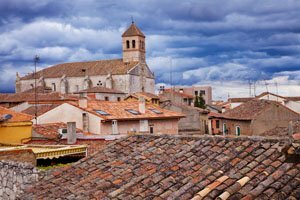 In the 17th century, Valladolid, as the then capital of Spain, formulated strict laws that sought to make the most of the chalky clay soils that retained the sparse rainfall and gave a hint of the quality that could be achieved here. The rest is history, for the wines of the Ribera del Duero have continued to improve to this day, creating one of Spain’s first internationally recognised wine-growing regions and a Denominación de Orígen that carries quite a bit of caché. Much of this is built on the reputations of estates such as that of Vega Sicilia, long regarded the producer of the country’s premier wine. The estate of Vega Sicilia, near Valbuena de Duero, was first planted in the 1860s with Bordeaux grapes, retaining a small quantity of the local Garnacha and Tempranillo (known here as Tinto Fino or Tinto del País). Those drawn here primarily by their love of all things viticultural gradually discover that the Ribera del Duero and its surroundings on the plains of Old Castile are full of history, character and beauty. An interesting note about Vega Sicilia is that unless it is an exceptionally good year, they do not use the Vega Secilia label. Most years, therefore, the wine bears the label of ‘Valbuena’. Just above Valbuena lies a beautiful Cistercian monastery founded in 1144. In its peaceful serenity and simple beauty, not to mention its rural seclusion, it is representative of the region, with its many hidden pleasures waiting to be discovered. In that sense, this part of Castilla la Vieja rewards seasoned travellers especially well. Naturally, Vega Sicilia isn’t the only estate of high standing. The cooperative at Peñafiel, with its cellars under a Moorish castle, produces refined wines using the Tinto Fino and aging its Reservas in oak. Pesquera de Duero, likewise, enjoys a staunch following for their 100 per cent Tinto Fino wines. Although it was only in 1982 that the region was defined as a Denominación de Origen under the name Ribera del Duero, it enjoys a reputation that far outshines neighbouring areas such the Ribera de Burgos, whose wines tend to be paler and lighter than the hefty reds of Valladolid. If you’re visiting the vineyards of the region, this large, historical city is an obvious stopping-off point. Although settled by Iberian and Celtic tribes several thousand years ago, Valladolid was first mentioned as Belad Walid after being captured from the Moors in 1074. Small and insignificant until then, its strategic location in the heartland of the Castilian state saw it become the seat of the Counts of Castile and, for a short period, even capital of Spain. As such, Valladolid witnessed some of the most important events in Spanish history, including Ferdinand III’s coronation, the wedding of the Catholic Monarchs Ferdinand and Isabella, the death of Christopher Columbus, the imprisonment of Miguel de Cervantes and the birth of Phillip II. As a result, Valladolid is a city rich in monuments. Its cathedral, located in the old part of town, is still unfinished. Churches, convents and monasteries displaying many architectural eras are scattered around, as are palaces, mansions and grand public buildings. Also worth a visit are the museums of sculpture and archaeology, the old royal palace and the city’s Plaza Mayor, as well as the house where Columbus lived and died, and the small museum dedicated to Cervantes. 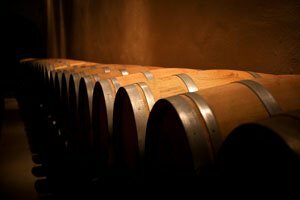 Valladolid is perfectly situated between Ribera del Duero and Rueda, another wine growing region of growing fame. Originally an area producing sherry-like white wines, it was spotted by the Rioja-based bodega of Marqués de Riscal. Their interest lay in the local verdejo grape, with which they and subsequent bodegas like Marqués de Griñon have been able to create some of the finest white wines in Spain. Crisp and fruity, Rueda whites are a veritable success story, underlining the agrarian traditions of a region whose wool market at Medina del Campo was the largest trading fair in Medieval Europe. It was the wool produced in the pastoral surroundings of this pretty Castilian town that brought untold wealth and power to Old Castile, laying the foundations for what was to become one of the largest empires in the world. Once the residence of the Isabella la Católica, who spent her last years here, Medina del Campo is a delightful town of Mudéjar-Gothic monuments, lively squares and peaceful gardens. Strolling around its old streets and looking out over the agricultural land towards the distance, where the vineyards stretch to the Duero, you get a pleasant sense of having discovered a true corner of Spain where life is still quaint and the clock doesn’t tick quite as fast. This entry was posted on Wednesday, March 14th, 2012 at 6:01 pm	and is filed under Environment, Food & drink, General Interest. You can follow any responses to this entry through the RSS 2.0 feed. Both comments and pings are currently closed.